After I had my son, I knew that I wanted to be a stay at home mom, but by the time my son was four, I needed something else to do. It was important to me to have a flexible schedule and I wanted to make a little money, too. I started off selling graphic designs on t-shirts in a Cafepress shop and someone told me I should start a blog to promote my shop and since I love to write, this seemed like a great option for me. Within the first week, I knew I didn’t want to sell t-shirts anymore and wanted to blog full time. That was almost eight years ago (April 1st, to be exact). I really didn’t know what I was doing and if you told me eight years ago that I could/would be able to not only make a little extra spending money from blogging, but make a decent income right from the comforts of my own home, I would have never believed it. All I knew was that I loved blogging. When I say I didn’t know what I was doing, I really mean… I didn’t know what I was doing. I read a lot of blogs, but I didn’t know anyone that blogged or how to go about it. So I googled, and read, and learned everything I could about blogging. If you were to take a look at my archives and see my earlier posts you’d see I’m telling you the truth. It was a learning process and I didn’t make the first penny from my blog for the first three years (closer to four). Hindsight is twenty-twenty and if I’d known back then what I know now, I would have done some things differently and definitely would have been making money a lot sooner. I sure would have appreciated an affordable blogging class. If you’re thinking about starting a blog, new to blogging, or even if you’ve been at it awhile, but finding it difficult to get your blog to make money, you don’t have to go through what I did, because I know your time is valuable… you can start blogging the right way and monetize your blog in a lot less time. I would like to save you the time and trouble and the chance to make your blog work for you by sharing this amazing deal with you — through April 4th only, Blogelina is offering a special deal on their popular 4-week blogging class — Profitable Blogging for Beginners — Enroll for just $.99 (normally $25)! I would have been all over this class 8 years ago like jam on toast. And all that for just $.99! Now that’s a steal! Blogelina has been featured on the Dave Ramsey show, and is well-known for their ability to help bloggers make a successful start. Hundreds of bloggers here have gone through this course in the past and taken away the tools to make their blogs a success. Remember, it’s only $.99 until April 4th. Don’t miss out on this deal — Sign up for the Blogelina Profitable Blogging for Beginners class today! All this for less than a cup of coffee. *If you’re not 100% satisfied with your experience with Blogelina, you are free to walk away at any time during the class session! PLUS, you’ll get to keep your copy of the class manual and your free year of hosting – Blogelina will refund your money! This deal is too good to pass up. To answer my question, “Can you make money blogging?” Yes you can! I can’t wait until YOU are not only blogging, but making money from your very own blog! 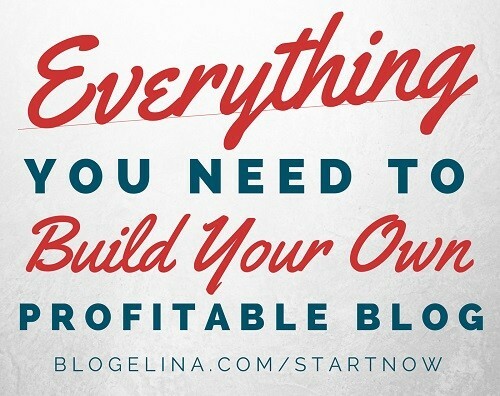 Whether you’re just getting started with blogging or maybe you’re looking for ways to bring your blog to the next level… the Blogelina Profitable Blogging for Beginners class is for you. That sounds like a really helpful class. I am finally making money from my blog, but it was not easy to get to this point. I have a friend who is taking a class like this. For me, I don’t want to feel I have to be tied to my blog, so I choose not to make money on it. I just blog for fun. Terry, blogging just for you, is awesome, too! 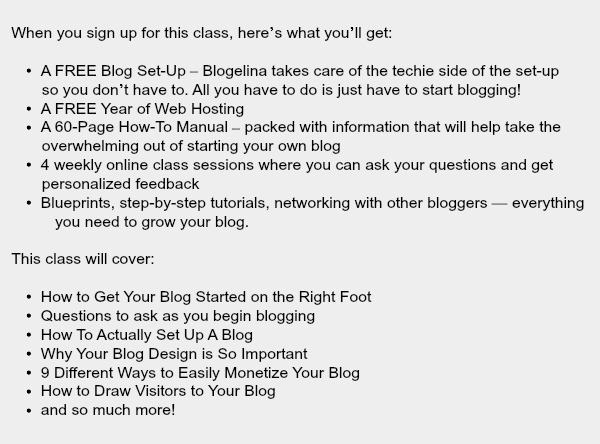 People who just want to blog for fun or whatever personal reason, could greatly benefit from the Blogelina blogging class. I love this. It’s a very difficult prospect to make money blogging, and sometimes it can feel impossible, but it’s TOTALLY doable. People need to realize that you can make money with a blog but it’s almost never instantly. It’s a process and will take time. Betsy, absolutely. But with the help that is out there like this class, you can monetize your blog a lot quicker than I did when I started 8 years ago, though. And I love that… I love hearing about bloggers that earn an income from blogging. This is wonderful! I can attest that there is a lot of money to be made blogging. I make an equivalent income to teaching. Monetization is super tricky, preparing before you begin is smart! A lot of people want to know how to monetize their blog. Classes like this can be helpful. What an awesome blogging package. This could really accelerate your start-up blog into something great! This sounds great! Luckily I’m making wonderful money on my blog which I’m so thankful for but this sounds like a wonderful help to all! I just blog as a hobby, but I do make a little money here and there. Like Robin, it wasn’t easy getting to that point, but every little bit adds up! Holy moly, $0.99 is a steal for a blogging class! Thanks for spreading the word for bloggers to take advantage! Sounds like an amazing class for seasoned bloggers as well as new ones. There is such a mix of both right now. Everyone wants a quick income but it takes work. Wonderful testimonial about blogging. I appreciate the information also. I have a few friends and relatives who would really like to learn how to blog. Sadly, I do not have near the time it takes to really teach them what the need to know. I will be passing this information along to them. I sure wish they had a class like this when I began blogging five years ago. I would be curious to see what they teach even though I am experienced now. It is never too late to learn. These are great tips. It is wonderful being able to make an income from home! Thanks for this helpful post. I’ve been thinking about this for a while. I’m gonna give it a try. You certainly can’t beat that price for training. Thanks for sharing! Sounds like a good class. Helpful for those who want to monotize. Sounds like a great class. I would totally sign up to take the class. This would be a great class for my sister to take. She is just starting her blogging adventure. I put a lot of effort into it, I’m hoping soon I’ll start to make some money to help me pay my student loans. I was/am happy to have gotten them, but debt is a huge ball and chain. I am a full time blogger. For me this is the best job in the world and I feel so incredibly blessed! This was very interesting. I have often thought about blogging but I am 53 and I think that may be a little too old. Great article. You’re definitely not going to get rich quick blogging, but hard work and time it will eventually pay off. Great resource. I actually started making money last year but thats not bad seeing I’ve only had this blog for 2 years. I will be honest it was only just a few years ago brands started to incorporate blogging into their marketing and branding strategy…so back in 2006 when I had my first blog the only way to make money was like Google Adsense or something pay per click. I am glad there are other and bigger ways to make lucrative money as a blogger. Good class for bloggers. Making money takes time and effort. I am pinning to my Blog Info board. I never imagined making money on my blog! I am amazed how much money I’ve been able to make with something that started as a hobby.